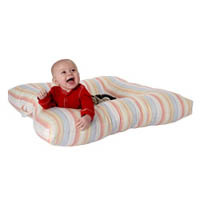 With six-inch high cushioned bumpers on all four sides of a recessed center, the Floor Nanny ($56.99) cushion promise to be a safe and portable heaven for your baby to rest and play. I love Baby Einstein DVDs. I suppose that it was natural that I would fall in love with the DVD MAGIQ ($50; Tiny Love) when I saw it on a magazine blurb. I added this marvel to my must-have list. A plush dog or cow interacts to the on-screen content. Available in 2 age-appropriate version: 3-12 and 12-36 months. Often, kids and clutter go hand-in-hand. 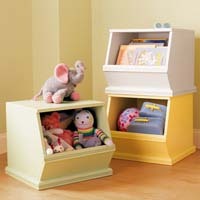 To help you get clutter under control Land of Nod, Pottery Barns Kids and CompanyKids ($99-$399) are carrying stackable storage bins, perfect for storing toys, books and games, available in a variety of colors. Not long ago I was pleasantly surprise to see a wide range of electronic learning toys by Vtech. I knew about Vtech telecommunication products, since I have been using their products for several years now. 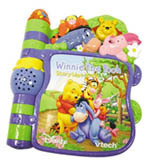 Vtech is famous for providing high quality, innovative and affordable products. Without a doubt, their electronic toys follow the same path.